If you'd like to read his letter to Canadians in it's entirety, you can do so here. Wishing you a wonderful and blessed day! Tomorrow is Week 2 in the Stamping Queens Sketch Challenge and that's when I'll reveal the whole card. 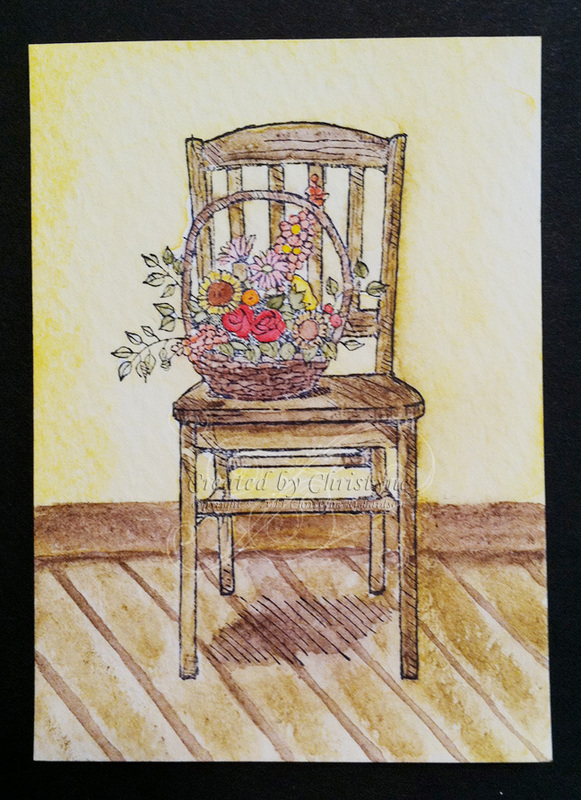 I was going to toot my own horn when I posted the card, but because of the nature of post, I've decided against it. 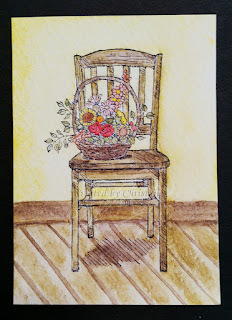 I'll just tell you that the image is watercoloured using our watercolour crayons and aqua painters. I'm in Montreal this week with my honey! He has meetings during the day so I get to explore the city in which I grew up - SO many fun memories!! His evenings are mine though, which is good because tomorrow we celebrate our 20th wedding anniversary. Yes...I KNOW I look WAY too young to have been married that long - LOL! Ok...so I'm the cat - LOL and while I will technically be away, I'll have my laptop, so I won't really be gone. Does that even make sense?? You, my readers, are the mice. Which means, you get to play!!! Place an order between $25 and $50 and receive a 5% discount off your order. Place an order between $50 and $100 and receive a 7% discount off your order. Place an order between $100 and $150 and receive a 10% discount off your order. Place an order OVER $200 and receive a 15% discount off your order as WELL as earn ALL the hostess dollars on your order. You MUST contact me to place your order. The Stampin' UP! online ordering system will not recognize this discount because I am the ONLY one offering it. Once I have your order, I'll contact you for your payment information and place the order on your behalf. Shipping and taxes will be calculated on the PRE-DISCOUNT amount. Shipping will STILL be a minimum of $9.95 or 10% (whichever is greater). If you would like to PICK UP your order from me, your shipping cost will only be 10% as I will be combining orders together. This offer is only valid until 5 PM EST on August 31st. After that time, I'll be out celebrating my 20th wedding anniversary with my honey and will NOT be checking email. The Summer Mini expires on August 31st at 11:50 PM MST. August 31st is ALSO my 20th wedding anniversary, so PLEASE don't wait till 10 p.m. to email me with your order. It WON'T GO THROUGH! The Buy 3, get 1 FREE paper special ALSO expires at 11:50 PM MST on August 31st. I'll be doing a little bit of blogging via ZAPD (a micro-blogging app) from Montreal. Hoping I can figure out how to get it to post here! Shannon West shares her tips and tricks for getting perfect punches!!! And once you're hooked...you can click on "SHOP NOW" in my sidebar and order yours! A Design Team? Me? REALLY? 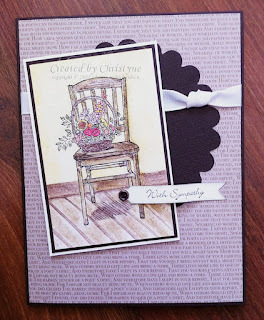 A few weeks ago, my friend Cristena put out a design team call for her "Stampin' Queens". I've never been part of a design team before, so I wasn't sure if I should apply or not. I've always WANTED to be part of a design team (because I think it's pretty cool! ), so I emailed Cristena and her response was, "HELLO! Of course!" The sketch we were given was square and while most of my design teammates opted for a larger square card (at least to me it looks like they did! ), I decided to challenge myself even FURTHER and create a 3 x 3 card! I know...crazy, right? LOL! Anyway, I had some 3 1/2" strips of Early Espresso left over from another project, so I cut it down to six inches and trimmed off the extra 1/2" creating my 3 x 3 card. Then I cut some strips from the Early Espresso Designer Series Paper which can be found in the Neutrals Designer Paper Series Stack. 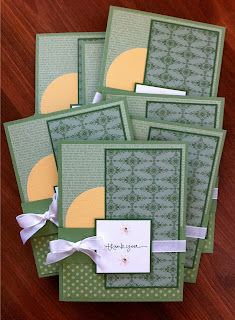 For my large circle, I punched out a piece of Very Vanilla Cardstock with my 1 3/4" punch. Then I used my Circle Scissor Plus to cut a circle slightly smaller and used the negative to put over my 1 3/4" punched piece and sponged inside that circle leaving a thin border with no colour. To stamp the leaves inside the circle, I used Soft Suede Ink and stamped off before stamping into the circle (with the mask still in place). 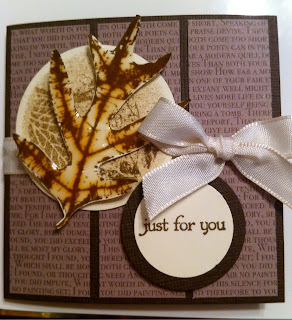 I stamped the sentiment in Soft Suede on Very Vanilla Cardstock and punched it out with my 1" circle punch. It was matted on a piece of 1 1/4" Early Espresso. The finishing touch was stamping the large leaf from French Foliage on Very Vanilla and cutting it out. I then covered it in Crystal Effects and let it dry before adhering it to the front of the card using Stampin' Dimensionals. Well, you don't get JUST this (the picture), you get a REAL card sent to you with a real postage stamp and it will land in your REAL mailbox soon! "Awesome Event!!! Well organized and lots of fun. I learned a lot and definitely would attend again. Way to go Christyne!!" "I had a really great time! The cards looked wonderful and weren't too difficult to put together. The 3-D projects were cool and it was so helpful to have everything cut and scored before we started! I would love to come to another event!" Mark your calendars NOW for my next BIG event! We'll spend a 1/2 day together (choose between two start times - 10 a.m. or 3 p.m) creating an adorable Christmas/Holiday album using the Simply Scrappin' Kit and 6 X 6 Album from the Holiday Mini. You're going to LOVE IT!!! I've reached for it NUMEROUS times since I bought it back in April! 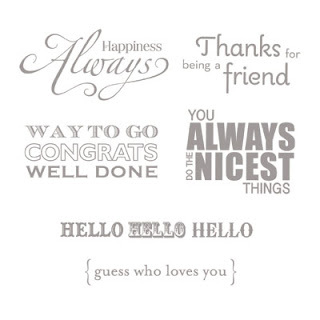 It's easy to use and is sure to make someone's day when you add it to a card. My Stamp-a-Rama attendees enjoyed using it on Saturday! You can order it from me directly from my online store. No need to leave the house! 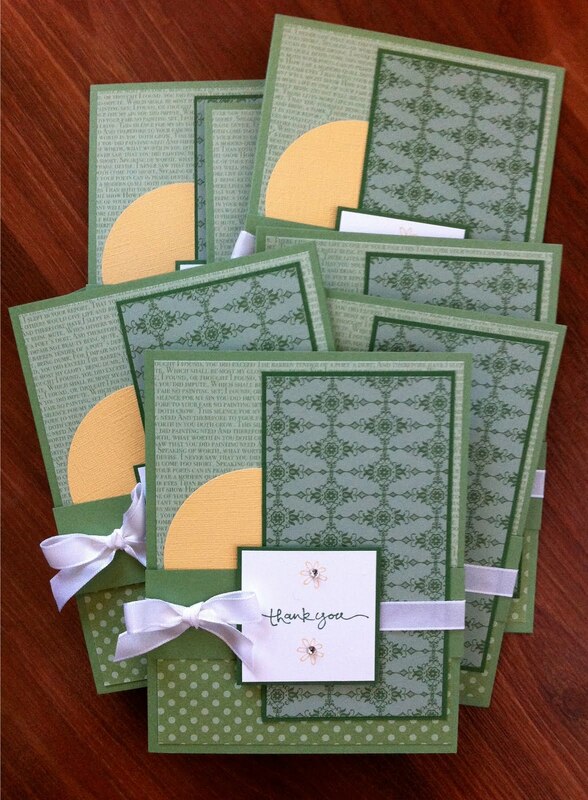 Elegant cards in an instant—thank-you cards or any-occasion cards. We’ve done all the work for you. Precut and color-coordinated—all you have to do is customize and send them off! Coordinating Everyday Wishes Set and ink sold separately. 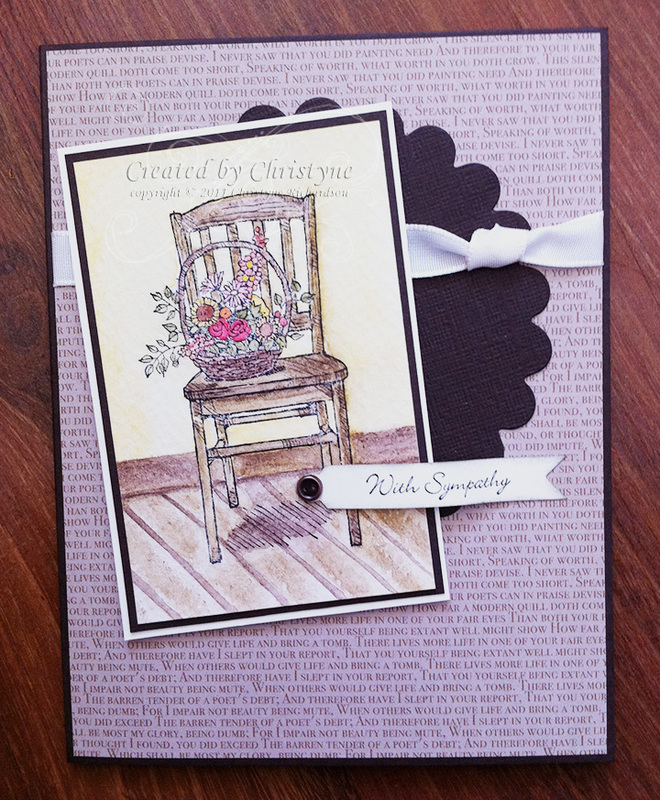 Kit creates 8 total cards (4 each of 2 designs) and coordinates with Baja Breeze, Cherry Cobbler, and Whisper White. 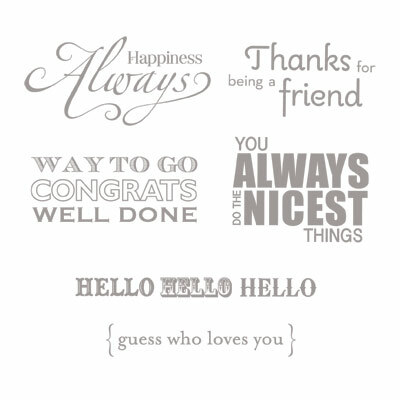 These cards are perfect for the beginner stamper who wants to create a fabulous card with no fuss as well as the seasoned stamper who needs a quick card at a moments notice. You can order these and everything else you need right from the comfort of your home by visiting my online store. A new Blog Tour coming - don't miss out!!! This post will remain at the top until the Blog Tour! Please scroll down to see what else I've been doing! With Definitely Decorative stamping, you can create custom interiors at a fraction of the cost. 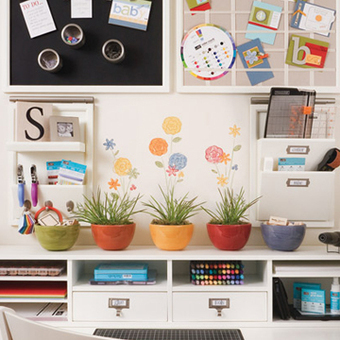 Customize your home décor by stamping walls, fabrics, and other furnishings to give them an entirely new look. You'll also love how easy it is to create hand-stamped, framed art. 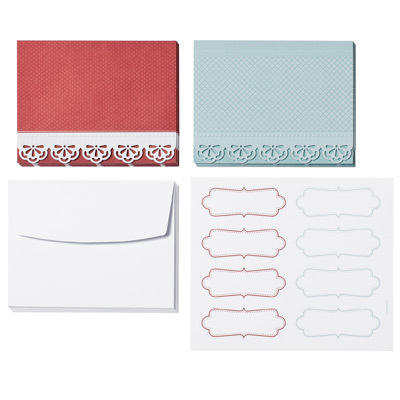 Use any stamp set and colour palette to create custom home accents for any season or occasion. 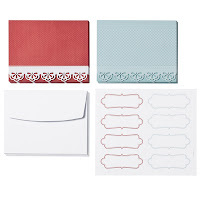 We have several stamp sets specifically designed to be used to create home décor; you'll find these sets designated with the Definitely Decorative logo. OK, really...you're NOT getting a chicken dinner - LOL! But what you ARE getting is a prize! Ten days ago, I posted this and asked you to tell me which technique you thought I used to colour the flowers. Clearly, I didn't use the correct language because what I REALLY wanted you to tell me was WHAT I used to colour the image. Several of you guessed blender pens which is ONE of the tools I used, but I also used...ready? 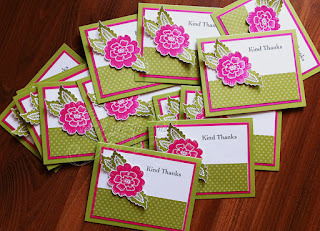 STAMPIN' PASTELS!!! Since no one guessed EXACTLY what I used, I used random.org to select TWO winners who will each receive a little gift from me. So, Shirley (2nd comment) and Kehkshan (7th comment), please email me with your snail mail addresses and I'll have something in the mail for you! A Baker's Dozen of Thank You! 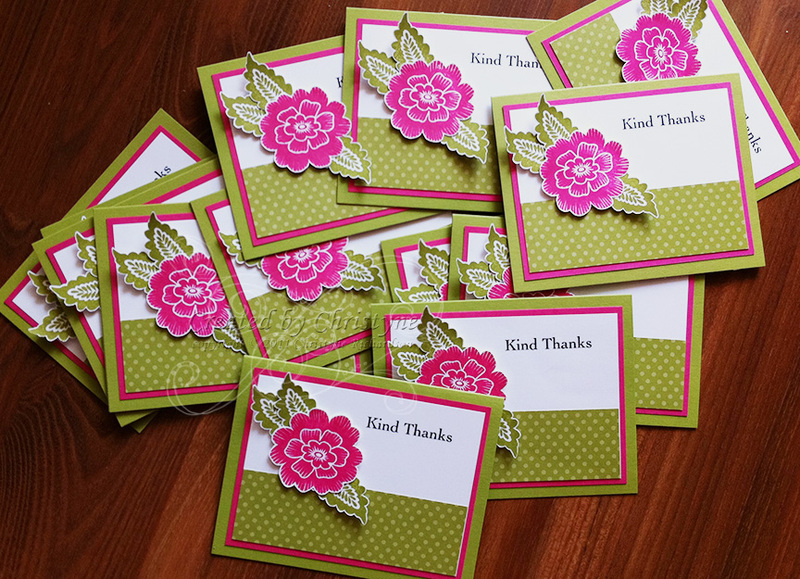 Thanks to inspiration from fellow demonstrator Ilina Crouse, I created these for my August Thank You cards. I stamped all the leaves and flowers and HAND CUT (YES! That's how much I appreciate my clients!) each and every one of them. I used Lucky Limeade (one of the new in colours) and Melon Mambo (a perennial favourite). The sentiment was stamped in Basic Black on Whisper White. Please excuse the quality of the photo. As you may have read on my blog earlier this week, I am without a camera. I had to use my iPhone. While the quality of the photo is ok, it certainly isn't up to my regular standards. No, you haven't entered some kind of freaky time warp...it is indeed Wednesday. I was away on Monday, so didn't get a chance to post an MDS Monday and besides, this photo, which I swiped from my Dad, was only uploaded to Facebook yesterday! However, since I (almost) always upload MDS projects on Mondays, I didn't want to mess with my post title - LOL! At any rate, yesterday was a pretty crappy day and I wanted to work with something that would make me smile. The picture in this little 6 x 6 layout does just that. This is my GRAND Aunt Anne and her daughter Melodie. I know a lot of people say GREAT Aunt when referring to an Aunt of an older generation, the correct term is actually GRAND when referring to a sibling of your grand parent (in this case, Anne is my Grampy's sister). If I was talking about a sister of my GREAT grandparent, then she would be my Great Grand Aunt. Confusing enough for ya? LOL! Anyway, I still just call her Aunt Anne and I love her to pieces! 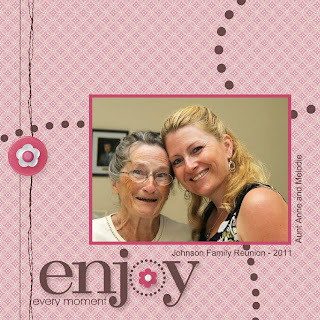 The photo was taken on Saturday evening during the 2011 Johnson Family Reunion dinner. The dinner was attended by at least 4 generations of Johnsons...there may have been five, but I haven't figured out the math - LOL! Anyway...for the layout I used the Springtime Vintage Designer Series Paper. I just LOVE that nothing retires in MDS! All my embellishments, stamped images and text were done in Chocolate Chip with a few done Rose Red and Whisper White. P.S. I'm keeping the blog candy here open till Friday, so you still have a few more days to enter! It's a sale! A PAPER SALE!!! Have YOU checked it out yet??? 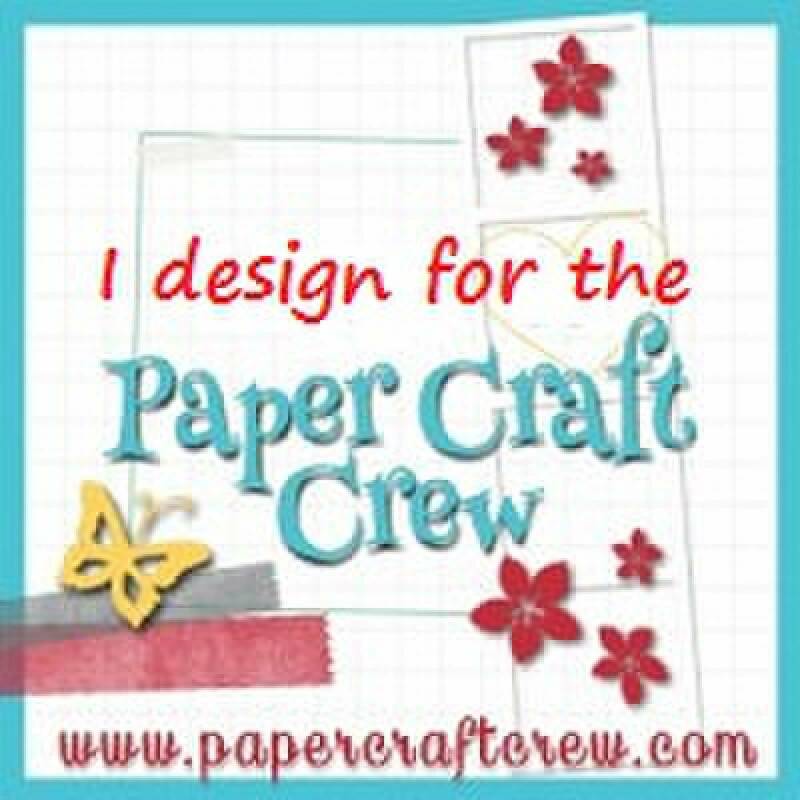 It's all about the PAPER this month at Stampin' UP! Buy 3 packs of selected Designer Series Paper and get one FREE! Yep! FREE! No catches, no jumping through hoops, no gimmicks! Just buy three packs of selected DSP and get one free!